Tuesday, September 6, 2011 at 9:26 pm. 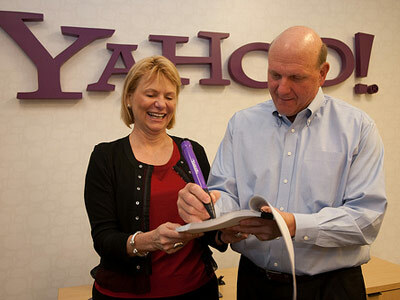 Yahoo unceremoniously fired its CEO Carol Bartz today. Not surprising — she hasn’t really done much with the company. Not that the guy before her (Jerry Yang) did, except blow a huge deal with Microsoft. Nor the guy before him (Terry Semel). Etc. Actually, it’s pretty amazing that Yahoo is still around and is still one of the biggest Internet companies in the world. It has been so long since Yahoo has done anything cool or interesting. (And I used to think Yahoo was cool enough that I even got a Yahoo-branded Visa card — with Yahoo rewards and everything!) It has wasted so much talent and so many resources (Flickr). It has done pretty much everything as mediocrely as possible for so long. It has squandered its early lead more times than I can count. Yet Yahoo still has a gigantic web and mobile audience and generates billions of dollars of ad revenue per year. Heck, it still has 16% of the U.S. search market! The Internet is supposedly a fast-moving creature where winners and losers change on a daily basis. But the truth is that inertia is a heck of a force, and Internet habits die slow. Yahoo is proof that even the worst-run big companies can still stay very big for a very long time. As disappointing as Yahoo has been over the years, it’s actually kind of impressive that it hasn’t collapsed.